Stunning property located high up Whistler mountain, slope side at Taluswood The Bluffs. This superb 3 level townhouse has 3 good sized bedrooms, spacious open floor plan with high vaulted ceilings and the most majestic view from the living, dining and deck areas. First level ground floor entry with convenient shelving, storage and bench to keep your ski equipment dry and safe. Two bedrooms, main floor full bathroom , living, dining and deck. 1st bedroom has Queen bed. Main floor bathroom has been renovated. Kitchen is carefully equipped to make your stay comfortable. 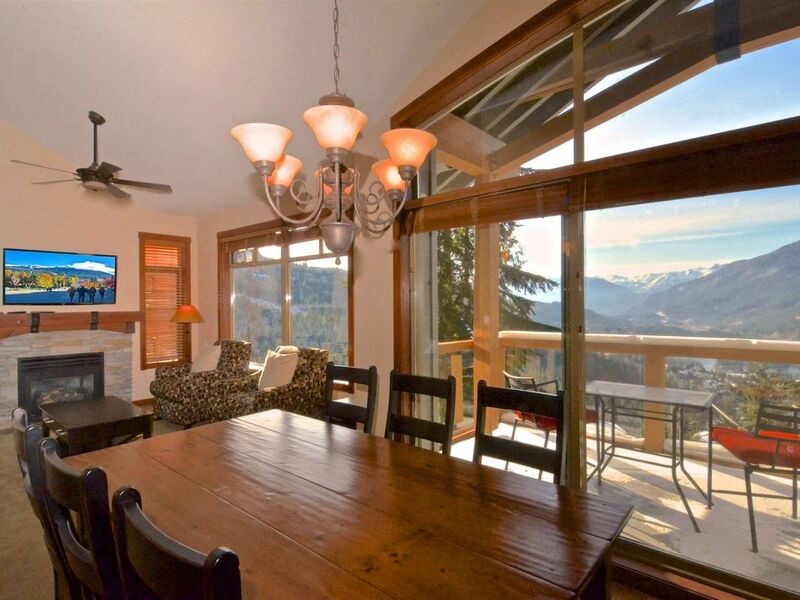 Majestic high ceilings in the living room and and dining area with one of the best Views in Whistler. Comfortable modern decor, gas fireplace and wall mounted large screen TV. Dining for 8. Outside deck has year round BBQ grill for your convenience . Upstairs on top floor you will find the lovely master suite with King bed, full walk in closet and brand new ensuite bathroom. This lovely unit has in suite full size stackable laundry, Free WiFi, secure underground free parking, bike storage, and a common hot tub perched on the mountain side nestled within the trees to enjoy the beautiful view. Please note this is a NO smoking property as well as on all decks and common areas. We offer discounts on lift tickets, ski rentals and transportation from the Airport if required. Had a great time at this condo. The walk to the Creekside ski run was negligible which was very convenient. The view from the balcony looks out over the valley and is second to none. Would stay again 100% if I ever find myself back in Whistler. Nice place. Not really ski in ski out. Broken hot tub. Called but no response. Good beds. Overall, nice. Hi William, Sorry about the issues with the hot tub, unfortunately Strata did not notify us of this issue and we do not control the maintenance of it.. hope you still enjoyed your stay and would come to Whistler again! This condo was nicely decorated, very clean, and just minutes from Whistler. It helped us to enjoy a wonderful holiday! Thank you for the review Sonya! Even though there a mix up with the cleaning, they handled it quickly and efficiently to get us into the property as soon as possible. The condo was clean, well maintained, comfortable and had an amazing view. It was a short drive to anywhere we wanted to go in Whistler. We would definitely stay here again and recommend it to all.